Toronto auto dealer and NBA super fan Nav Bhatia signs autographs on the red carpet of the Toronto International Film Festival. Nav Bhatia is likely the most recognizable car dealer in the country. While his two dealerships in the Toronto area — Mississauga Hyundai and Rexdale Hyundai — are prominent and prosperous, his notoriety is definitely a function of his off-hours passion — the Toronto Raptors. 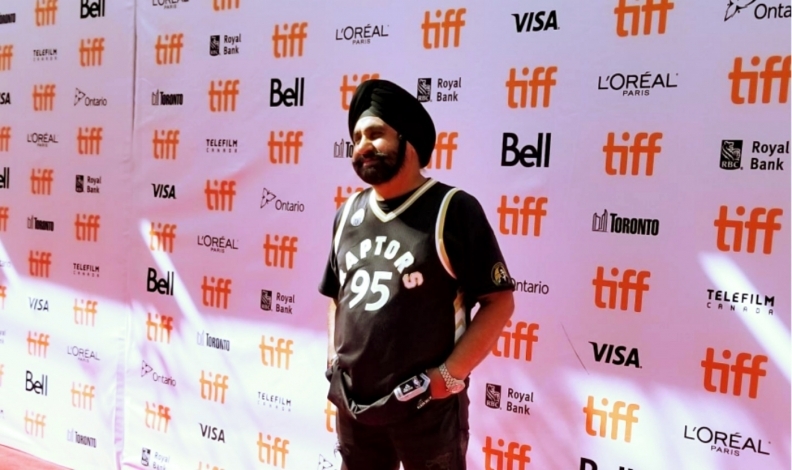 Bhatia, aka the “Super Fan,” hasn’t missed a Raptors’ home game in 22 years. And with courtside seats and a gregarious personality, millions of TV viewers have seen him energetically supporting the home team, and engaging with players and everyone else around him. More fame came his way Sept. 9, when he found himself on the “red carpet” alongside some celebrity A-listers, before a gala screening of the documentary, The Carter Effect, at the 2017 Toronto International Film Festival (TIFF). He was one of the many sports personalities and celebrities featured in the documentary, which examines the rise of the Toronto Raptors, and how the team helped put Toronto on the world’s pop culture map, and the pivotal role that number 15, Vince Carter, played in those two ascendancies. The production company behind the film is Uninterrupted, the brainchild of NBA star LeBron James. James joined Drake as one of the four producers of the film. Nav Bhatia joined Lebron James and Drake on the red carpet at the Toronto International Film Festival. Both LeBron and Drake joined Bhatia on the red carpet, before the doc’s premier at the Princess of Wales Theater, as did track star Andre De Grasse, and present and past Raptors, such as Chris Bosh, Charles Oakley, Patrick Patterson and Corey Joseph. Vince Carter didnot attend, reportedly due to an illness in the family. In fact, Bhatia said he got more attention on the carpet than some of the athletes. The love kept coming ,too, during the various screenings. Bhatia noted he received “hundreds of messages” from people who saw the film, and relayed that his screen appearance got the most cheers, among the various sports and music figures featured in the documentary. No surprise was that he was featured in this film about Carter and the Raptors. Bhatia developed a close relationship with Carter, which continues to this day. “I talk to him no matter where he is playing," Bhatia said. Back in the heyday of Carter mania, Carter made many appearances at Bhatia’s Mississauga dealership. The documentary was directed by Sean Menard, of Hamilton, Ont., and its trailer can been viewed here.